Dugain spoke of a fisherman on a small island who spoke of a ‘huge plane’ in Malaysie Airline’s colours on March 8. He also said islanders had found an empty fire extinguisher from the plane in the water near Baarah island. The Senegal-born Frenchman, who is now a successful novelist, also told a radio station he was warned not to investigate MH370 by an intelligence source, who spoke of ‘risks’ and counselled him to ‘let time do its work’. Last week grieving family members of Chinese passengers from a missing Malaysia Airlines flight protested outside the foreign ministry in Beijing Friday accusing the government of failing to provide them with regular updates on the search for the aircraft. About 30 people, many of them elderly, gathered at the gates of the ministry with temperatures approaching freezing and were confronted by a line of police. 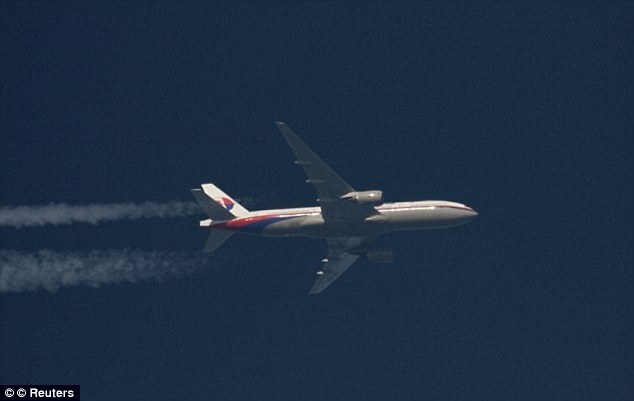 They demanded to speak to government officials in a bid to get more information on the search for flight MH370. Police manhandled and pushed protesters that attempted to enter the gate and warned passersby to leave the area immediately. ‘My son is alive and I want to know what the government is doing to find him,’ said Liu Dianyun, the mother of one of the passengers. Some drove for two hours to attend the demonstration, despite acknowledging that their efforts were unlikely to produce results. Chinese passengers account for about two-thirds of the 239 people who were aboard the Boeing 777, which vanished on March 8 en route from Kuala Lumpur to China’s capital. Dozens of their relatives were reportedly beaten and arrested earlier this year. Australia has been spearheading the hunt for the plane, which is believed to have crashed in the southern Indian Ocean off western Australia.